DF Series Application Installation Examples for application examples and typical configurations. Customers can send product samples to Vaccon to test at our in-house test facility where we will size the correct DF pump and send a video of the results. Modified versions of the DF Series Material Conveying pumps for specific applications are available. The DF 25-12-110-RI Aggregate Conveying pump is ideal for spraying dry and abrasive materials such as mineral fragments, stone dust, metal filings and ceramics.The DF 5-6-FD-ST8B Liquid Conveying pump can be used for field and mobile cleanup of liquids. Click on the links below for more information. Note: As of 1/1/17 Vaccon is transitioning the VDF/CDF/DF pumps from clear anodize to black anodize. The change in color does not affect the performance or durability of the pump in any way. Internal and external threaded exhaust and/or vacuum ports. Please see Custom section below. Teflon™ or hardcoat anodizing. Please see Custom section below. 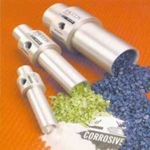 For chemical compatibility, heat and environmental requirements, food and medical applications, custom materials, special coatings and modified threads are available. The -3 versions of the DF Series pumps from DF 3-3 through DF 20-3 are no longer a stocked item. Consult the factory for availability. To achieve equivalent performance of a -3 pump, simply regulate the air supply pressure down to approximately 40 PSI with the equivalent -6 model. For example, to achieve the performance of a DF 7-3, use a DF 7-6 with an air supply pressure of 40 PSI. A copy of this table may be downloaded with the DF Series Operating and Installation Instructions. Custom threaded ends are available. For more details, download the DF Series Custom Threaded End Information PDF. Please note, DF units with threaded ends are custom, and therefore not returnable. Male and female threads can be ordered on opposite ends of the same pump, i.e. DF 5-6-TV50/MTE50. Tubing sizes specified in inner diameter (I.D. ), based on polyethylene / polyurethane tubing with 1/16” [1.5 mm] wall thickness. Vaccon discourages the use of quick disconnect fittings on all connections. Important Safety Note: When conveyng materials through plastic transfer lines, you must ground the transfer lines to dissipate the static charge that develops from the friction of the air and material flowing over the transfer line surface. Dimensional data for the DF Series Material Conveying Vacuum Pump is presented in 2D drawings, with all critical dimensions and port thread sizes displayed. Both imperial and metric units are included. Performance data for the DF Series Material Conveying Vacuum Pump is displayed, listing air consumption, vacuum flow at various vacuum levels, and evacuation times (for 1 cu. ft. or 1 L volumes). Data is presented in tabular and graphed formats, in both imperial and metric units. Vaccon’s DF Material Conveying Vacuum Pumps are available in custom materials, sizes, shapes, mounting options and end connections to suit specific requirements or manufacturing environments, such as food processing, semiconductor or pharmaceutical manufacturing. Vaccon VDF Series pumps are available in brass, stainless steel (303, 304, 316, 316L), PVC, Teflon™, PEEK and Delrin® (Acetal). Special anodizing is available - Teflon, hardcoat, hard anodizing, etc. For custom materials, anodiziong and end connections (threads), please consult the factory.